The Wilmington & Weldon Railroad (W&W) was the new name adopted in February 1855 by the Wilmington & Raleigh Railroad (completed in 1840), which ran from Wilmington to Weldon by way of Goldsboro and Rocky Mount, bypassing Raleigh. As a central rail link along the Atlantic Coast, it carried heavy traffic during the Civil War and made a considerable profit (in Confederate currency) for its owners. Because the W&W had its own facilities for rerolling iron rails and did not lie in the path of military action until the very end of the war, it suffered somewhat less than many other roads of the region and entered the Reconstruction period dilapidated but intact. For 20 years after the war, Robert R. Bridgers of Edgecombe County served as president of the W&W. With backers including the Walters family of Baltimore, he developed interlocking directorates, leases, and traffic agreements (using the W&W as a base) that led to the formation of the Atlantic Coast Line Company and the eventual merger with the Atlantic Coast Line Railroad (ACL). 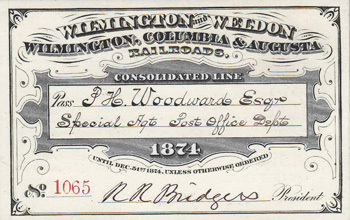 In November 1872 the W&W had been leased to its southern connection, the Wilmington, Columbia, and Augusta, but the lease lapsed when the latter road failed to pay the W&W dividend in 1877. Bridgers and his associates acquired control of the Wilmington, Columbia, and Augusta in October 1879, and in June 1885 they leased it to the W&W for 99 years. In 1898, under Henry Walters's plan to develop an Atlantic Coast Line system, the W&W acquired the southern half of the Cape Fear & Yadkin Valley Railway, with lines from Wilmington to Fayetteville and Sanford as well as from Fayetteville to Bennettsville, S.C. Two years later, the W&W and the Norfolk & Carolina (which connected the W&W at Tarboro with Norfolk), along with connecting roads in Virginia and South Carolina, as well as the Plant System lines in Georgia and Florida shortly afterward, all merged with the ACL, ending the corporate existence of the W&W. The ACL, however, established its executive and administrative offices in Wilmington, and the northern half of the former W&W (from Weldon to Wilson) became part of the ACL main line. In 1988 a 26-mile stretch of the original W&W from Castle Hayne, north of Wilmington, to Wallace was abandoned, breaking the physical integrity of the historic road. The old freight station on the Cape Fear River survives as a museum of the history of the W&W, the ACL, and North Carolina railroading, but the old passenger station in Wilmington was destroyed. H. D. Dozier, A History of the Atlantic Coast Line Railroad (1920). R. E. Prince, Atlantic Coast Line Railroad: Steam Locomotives, Ships, and History (1966). Wilmington Railroad Museum official website: http://www.wilmingtonrailroadmuseum.org (accessed July 31, 2012). McKown, Harry. "March 1840 - Wilmington & Weldon Railroad" This Month in North Carolina History (blog). March 2006. http://www.lib.unc.edu/ncc/ref/nchistory/mar2006/index.html (accessed July 31, 2012). James Owen to the public. 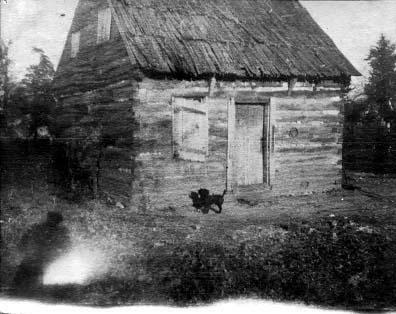 January 20, 1838. North Carolina Historic Sites. http://collections.ncdcr.gov/RediscoveryProficioPublicSearch/ShowItem.aspx?925+ (accessed July 31, 2012). Wilmington & Weldon Railroad Company. Proceedings of the Stockholders of the Wilmington & Weldon Rail Road Co. at their Twentieth Annual Meeting. Wilmington, N. C.: Thomas Loring. 1855-1880. http://digital.ncdcr.gov/u?/p249901coll22,417309 (accessed August 16, 2012). Annual Reports of the President and Directors and the General Superintendents of the Wilmington, Columbia & Augusta and Wilmington & Weldon R.R. Co.'s. Wilmington, N.C.: Englehard and Saunders. 1873. http://archive.org/stream/annualreportsofp1873wilm#page/n5/mode/2up (accessed July 31, 2012). Burke, James C. The Wilmington & Raleigh Rail Road Company, 1833-1854 Jefferson, N.C.: McFarland and Co. Inc. 2011. http://books.google.com/books?id=Bc1dcgpEbZoC&lpg=PP1&pg=PP1#v=onepage&q&f=false (accessed July 31, 2012). "Photograph, Accession #: H.19XX.74.1." Circa 1900. North Carolina Museum of History. "Pass, Boarding, Accession #: S.HS.2012.1.623." 1874. North Carolina Historic Sites. When I was in my childhood, Dad and Mom took me to Florida... and during that time on US 301 -- (LONG before Interstates!) Dad would often stop at a road crossing, and wait for the first train. Mom would 'rest up' and Dad and I watched the ACL on its route towards the same state we were going! Many times I asked Dad how the ACL was formed... Dad told me he didn't know, but had an idea it was mergers of smaller routes into one -- much like the US is formed from many states.